Where the not so desirable 1980’s Royal Oak building stands today, used to stand a grand Hotel and before that a market square. 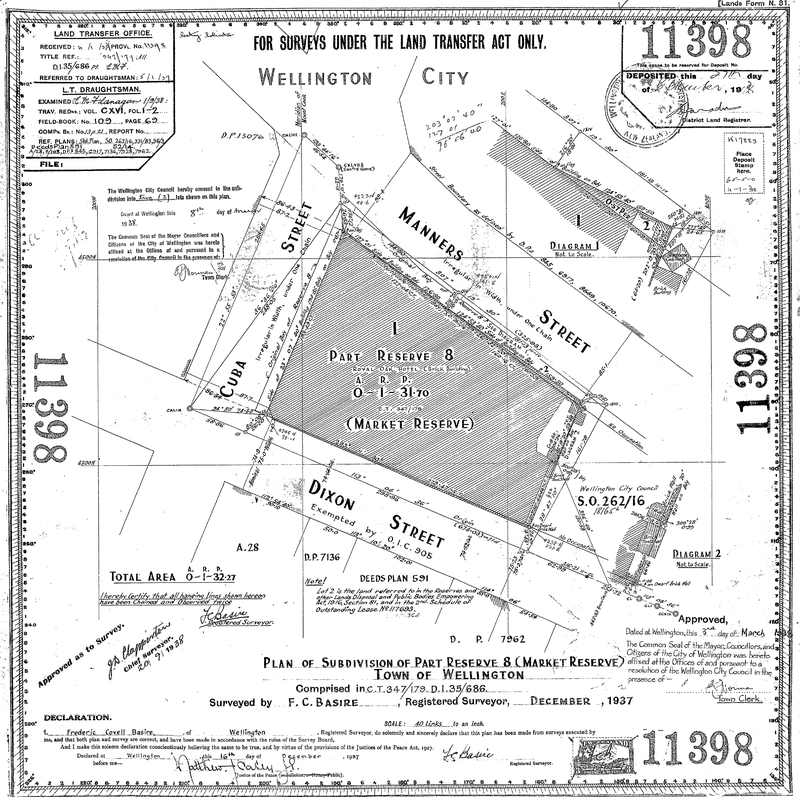 In 1840 the Cuba ship surveyors marked out a town acre of land that was flanked by Manners St, which at the time was a waterfront St, Dixon St to the South and Cuba St. This piece of land was owned by the town’s council and was for the use of the locals. The Market was a place where the early settles could sell their excess garden produce, a farmers market of sought. In the late 1800’s they built a Market Hall, probably because the Wellington weather was so inclement. Here you could by your vegetables and fresh fish. However in 1914 the town leaders must have come under pressure by local developers to sell the prime piece of land. In 1915 the hall was demolished and a Hotel erected on the site. 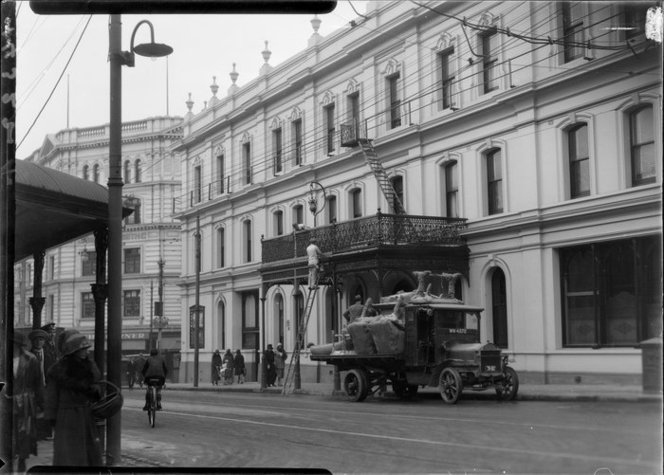 The Royal Oak was one of many Hotels located in Cuba St. where the local hard working laborers would meet to have cold ale and socialise at the end of the long day. In 1937 The Royal Oak was enlarged to consist of three stories with accommodation a dining room and four bars. From the 1950’s to 1979 local gays, transvestites, prostitutes and sailors frequented the Bistro and Tavern bars which ran along the Dixon Street side of the Royal Oak . Women were barred from most public bars but some private bars allowed “Ladies and Escorts only” this was intended to prevent prostitutes from working the bars. The Bistro Bar was one of the first to bend the strict licensing laws and offered a token meal (a bowl of rice for 2/6) and so becoming a licensed restaurant where both women and men could drink until 10pm. In 1963 it was still illegal to be homosexual in New Zealand so gay men formed natural escorts for lesbians under the no single woman restriction in public bars. Both parties then found more interesting company once they were inside. During the 1970’s the Bistro and Tavern bars were full of this vibrant gay community who felt at home amongst their own. These bars are also famous during this time as a place where heterosexual junkies and drug dealers could score. It is said that when the local police stepped into the bar you could hear the bottles of pills falling to the floor. As this building was constructed of bricks and mortar it was demolished in 1979 and the rather ugly building that is here today according to the council was consented on the understanding that it was to be a temporary building, obviously not a very binding agreement.